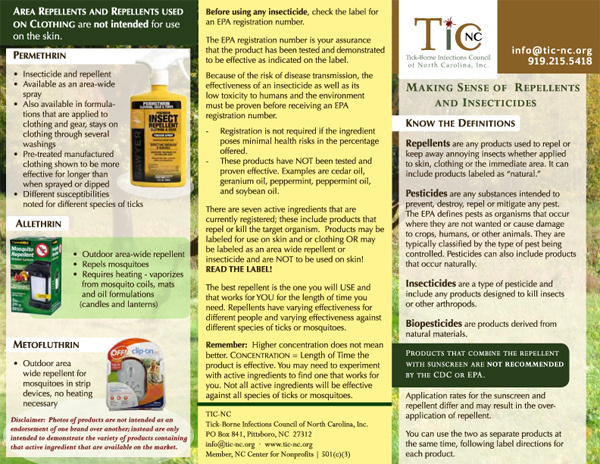 TIC-NC – Tick-borne Infections Council of North Carolina, Inc. The Tick-Borne Infections Council of North Carolina, Inc. is a non-profit organization working to improve the recognition, treatment, control, and understanding of tick-borne diseases in North Carolina. Visit the pages of our website to learn more about ticks in North Carolina and about tick infections. Educate the public, medical and veterinary pro­fessionals, school health nurses, and the public health system about tick-borne diseases in North Carolina, including risk factors, emerging infections, and prevention. Encourage state public health agencies to con­duct ongoing surveillance of the prevalence of tick-borne infections in North Carolina citizens and in ticks and vectors; and make this information available to the public and the medical sector. Work with the public health sector to ensure all tick-borne infections are reported at both county and state levels. Support the public health sector in identifying and characterizing the newly emerging tick-borne infections in the Southeast. Foster improved communication between health professionals and the public with respect to tick-borne diseases. Maintain a registry of persons with tick-borne diseases in North Carolina. 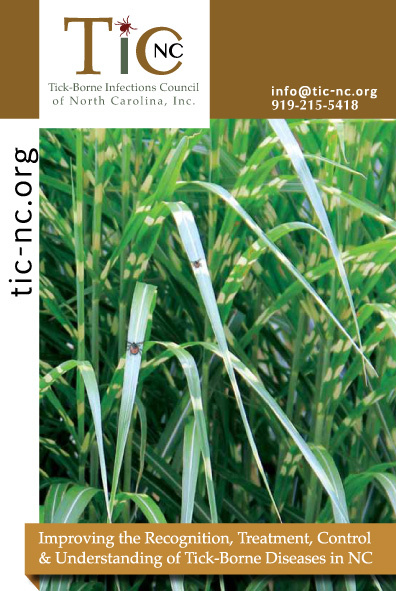 TIC-NC’s informational brochures provide current information on North Carolina ticks, NC counties endemic for Lyme disease, tick-borne illnesses, how to prevent tick bites, how to remove a tick, and more. 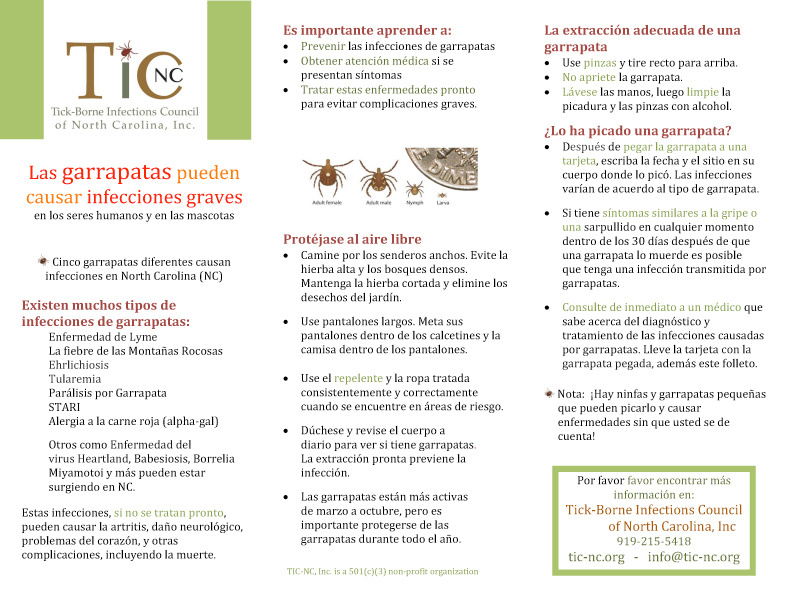 The informational brochure, in English and Spanish, is our newest edition, providing a handy reference on ticks, TBIs, and prevention in a nice, tri-fold brochure.We also have our Repellents and Insecticides brochure, which recaps options for standard and organic/natural tick repellents and insecticides, including treated clothing. We are happy to send these to you or your organization. Click on an image below to download/view the brochure. Until 2011, the Public Health Pest Management (PHPM) section of NC Department of Environmental & Natural Resources was charged with helping to protect the public from vector-borne diseases. Historically focusing on mosquitoes, they received additional funding in 2008 to expand their focus on ticks and tick-borne disease. From 2008 until 2011, PHPM conducted extensive tick work, aiding the public with disease prevention. Legislative action abolished the section in July 2011 leaving the state without any public health branch to continue these activities. Fortunately, in late 2016 and early 2017, in part because of Zika virus concerns and resultant funding, Michael Doyle was hired as one state public health entomologist. He previously worked on mosquito issues in Key West. A second entomologist, Dr. Alexis Barbarin, hired in January 2017, will be mostly involved with tick-related issues. Her background is in bedbugs She previously studied and worked at both Penn State and NCSU. Their efforts will help NC address mosquitoes, ticks and other arthropod vectors of disease-causing agents with the goal of reducing transmission of vector-borne diseases through public education and outreach and targeted evidenced based interventions. CHECK OUT our slide shows about NC ticks on the About Ticks page and about preventing bites and illness on our Prevent Illness page. Download a copy of our informative brochure. Learn more about JOINING our organization or HELPING us with a donation. If you are interested in helping support our cause, please contact us. Copyright © 2019 TIC-NC – Tick-borne Infections Council of North Carolina, Inc.. Powered by WordPress. Theme: Accelerate by ThemeGrill.